For years, I believed online teaching was a sellout. 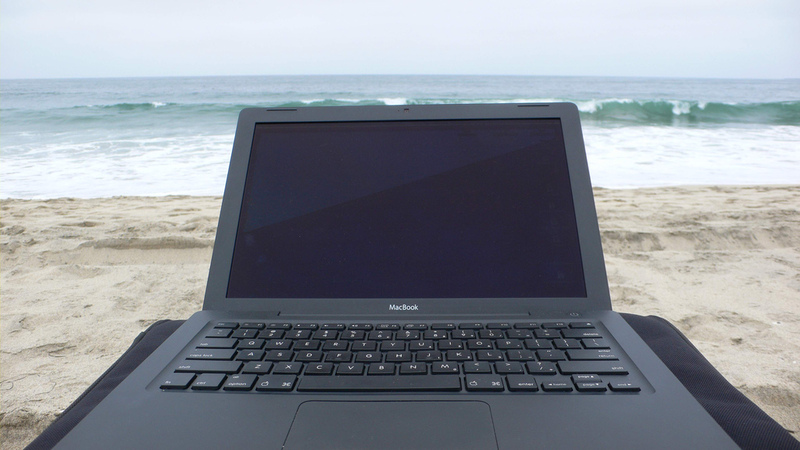 At best, it was education on the cheap; at worst, it was burnt-out educators wanting to teach from the beach. With the energy and enjoyment I derived from challenging classroom discussions and the satisfaction I felt after delivering a compelling lecture to inquisitive and questioning students, I wanted nothing to do with a teaching strategy that replaced classrooms with video, online discussion, and dense course websites. Teaching Human Ecology and Sustainability, one of my primary goals has been to ask students to critically examine the assumed role of material wealth in community well-being. Connecting with each other, with natural systems, with a wider community was not only a course concept, but one of my teaching methods. 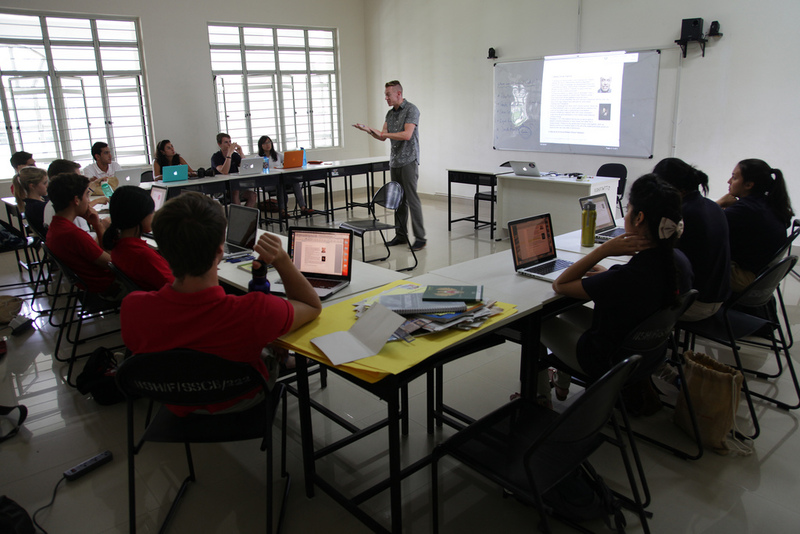 Discussion, debate, brainstorming, researching and co-teaching were integral to a transformative learning experience in this course. As such, I delighted in the person-to-person connections fostered in the traditional classroom setting. 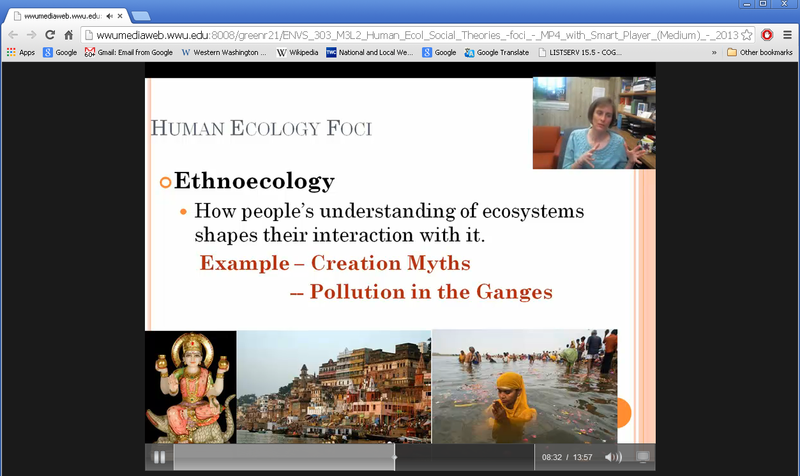 It was, therefore, slightly ironic that this course on sustainability and human connection was the course that taught me the value of moving away from traditional classroom teaching modes and towards digital ones. In the winter of 2013, my ENVS 303 Human Ecology and Sustainability class was backlogged with a waitlist longer than the course capacity. I had to experiment with ways to meet student demand. That winter I taught the course at double capacity. 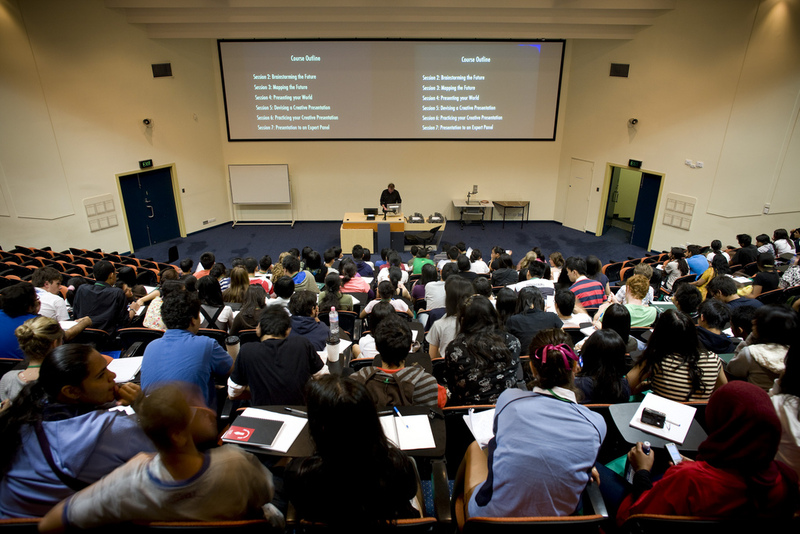 Walking into the auditorium packed with seventy-two students that first day, I wondered how well my typical course of in-depth class discussions, case studies, simulation games and student presentations would work with 72 students and an auditorium-style room in the Viking Union. I realized I was going to need new tools and began experimenting with a blend of in-class and online interactions. That first day, I had the students group into learning communities of about nine students each and gave them each a corresponding online group journal within the course website. During classroom discussions, students spoke within their learning communities. 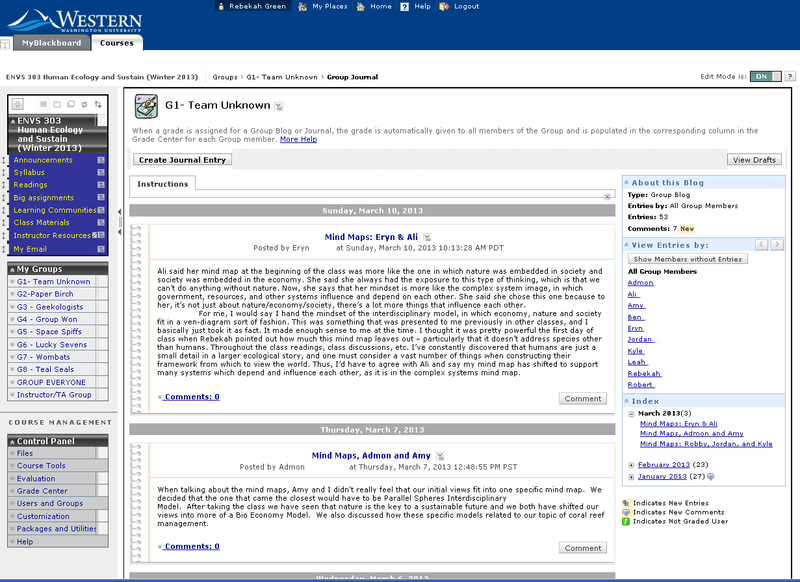 Each student periodically had the responsibility of taking notes and posting to their group�s online journal � a journal I reviewed after class and on which I added my own perspectives or a question meant to challenge the students further. During an environmental management simulation where students traditionally played the role of a fishing boat in a competitive, but adaptive, marine fisheries, the learning communities played as a team of captain and crew. Later in the course, students formed even smaller sub-teams to analyze and present a final case study of socio-ecological system interactions. I used online assignments to facilitate students developing a theme, share individual case studies and jointly develop their comparative analysis. These interactions came to supplant the traditional whole class discussions, individual student presentations, and individualized actors in the simulation. What I found surprised me. Rather than these group discussions and online activities being a sub-standard approximation of my traditional classroom discussions and individual presentations, they started to re-define how I wanted my students to learn. The small group discussions allowed each student more time to explore and share their opinions. The online journal allowed me to read and gauge each student�s learning and each group�s discussion in ways I could not do in the classroom. Individual journal entries allowed me to respond to students individually and thoughtfully, which was a level of engagement the quieter students had not received in the smaller classroom. The simulation in groups added a new dynamic of consensus decision-making that melded well with concepts of bottom-up resource management. With collaborative final presentations that built upon individual case studies, but required joint analysis, students achieved a deeper application of course concepts. They had to use critical thinking to find patterns across case studies, rather than apply concepts to a single case only. The use of online journals and learning communities in a face-to-face classroom environment gave me the tools I would then use to move to an online course environment. The next term, the department chair suggested I consider teaching an online version of Human Ecology and Sustainability over the summer. My chair handed me a book on online teaching and I said yes confidently, but with some private misgivings. I decided to build off of the large-class format I had developed in the Winter of 2013 as a starting place for an online course. I knew I could create an online course with a series of presentations, a list of reading links and a series of graded writing assignments that would generally match the course content of a face-to-face format. However, I knew this strategy would remove the peer-to-peer learning that deepened their commitment to integrating sustainability principles into their everyday decisions. It would also heighten a sense of remoteness between the students and I. I wanted to create as much of the dynamic classroom experience as I could; I wanted to be as much a part of their learning as I was in the classroom. Traditional Lectures. Traditionally, I provided some course content in traditional lectures that provided new material beyond the course readings and student research. However, because the course was to be taught online, I needed to convert these lectures to 15-minute mini lecture videos. To create these video lectures, I developed slides and wrote a script. The script ensured I covered content succinctly in a way that did not rely upon a dialogue with students for clarity or cadence. I recorded and edited these lectures in Camtasia Studio video editing software, where I could overlay three independent streams: a computer screen capture of my slide presentation, a webcam video of me giving the lecture in my office, and an audio capture of my voice. I edited all three to remove long pauses, overlaid the webcam image on top a blank space I left in the upper corner of each slide, and then uploaded them to the university�s Camtasia Relay site. The site returned a web link to each mini lecture, which I could upload to the appropriate module on the course website. Traditional Films. At several points in the traditional course, I show short educational films or documentaries to serve as examples of the theories the course covered or as starting points for longer discussions. I played and recorded these films on my computer, capturing and dividing them into short segments using the video editing software. I again uploaded links to the course website. One film was only available via VHS. For this, I worked with the university�s technology services to convert it to a digital format first, then completed the video capture and upload. Online Discussions and Synthesis. I converted traditional classroom discussions into online discussions, usually posing one discussion question or activity in each module. Much like my classroom format, I divided the online students into smaller learning communities and set up the course website so they engaged with the same small cohort of about five students for the entire course. To provide clear guidelines on the caliber of the discussion I expected, I required a minimum word count, reference to specific passages in the assigned readings, and citation and/or links to any facts used in their arguments. Forty-eight hours after the initial post was due, I also required students to post two or more structured responses to others� posts. At first I wondered what my role should be in these online discussions. Talking to several people who had taken online courses, I learned that students often appreciated instructor input but were also intimidated by it. Over the first few discussions, I tried varying degrees of engagement until I found a strategy which seemed to be most supportive. During the online discussions, I would not comment or actively be involved. However, at the close of each discussion, I would pick one learning community�s discussion for a recap; I read that community�s discussion carefully, then wrote a reflection on it. I would typically finish with what I hoped would be a thought-provoking follow-up question or connection to past or future course content or current events. 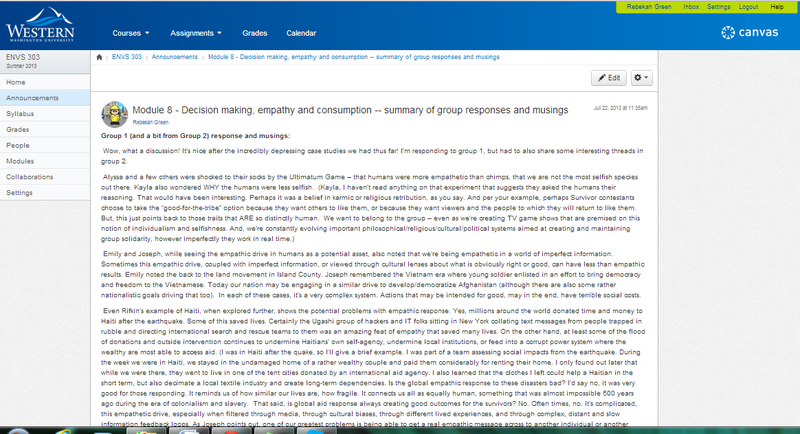 I posted this analysis as a class announcement and as a running wikipage, a strategy that allowed students, on occasion, to continue the conversation using the announcement reply feature on the course website. Over the entire course, I analyzed and reflected on each learning community at least three times. Online quizzes. An online class did not give me an opportunity to gage students� understanding of the weekly readings through informal questioning. To ensure that students had completed the readings and mini lectures before they took part in online discussions, I built reading and lecture quizzes of short answer and multiple-choice questions. These timed quizzes were required before students could enter their learning community�s weekly discussion. Typical Blended Classroom Module (readings, films, quiz, group discussion, assignment). The gray elements were not accessible until the student had completed the online timed quiz on the readings, film and/or lecture material. Traditional Classroom Discussions. Even with the video lectures and interactions with students through the online discussions, I knew something important was lost in never meeting the students. I craved that classroom experience. So, I blended traditional classroom meetings into the course, requiring that students attend several class meetings over the span of the quarter. I had to be creative requiring real-time meetings in an online course. Some students were out of town or even out of state at summer jobs. I gave students an option. They could attend face-to-face sessions on campus or could sign into an online meeting space through a web conferencing tool at a designated time using a webcam or headset. In the latter case, the tool allowed us to see and hear each other as well as see a screen where one of us could write on a digital board or share files. During these real-time meetings, I could build rapport with students and delve into activities that required, or were best achieved, in a synchronous learning environment. These sessions also allowed me to gage and adjust the course based upon a dialogue about what was working, or not. For example, the students let me know that my format for discussion due dates was confusing in the first session and we quickly developed a better system. Resource Management Simulation. One of the highlights of the Human Ecology and Sustainability course is the resource management simulation of a marine fisheries system, a simulation developed by Gene Meyers, a professor in environmental education and architect of many features of the course. Providing this experience to the students who came to a campus face-to-face meeting was similar to my traditional classroom experience. It was much more challenging to do the same for the students who selected the online meetings. My course TA and I strategized, coming up with a slide presentation that functioned much like the TV show Jeopardy game board. With the TA acting as a silent game show host, I had students make fisheries management decisions, pay fines and select options for adapting their fisheries. Students quickly adapted to using the chat feature to argue with each other about decisions and the voting feature to indicate their choices about catch goals or management decisions. 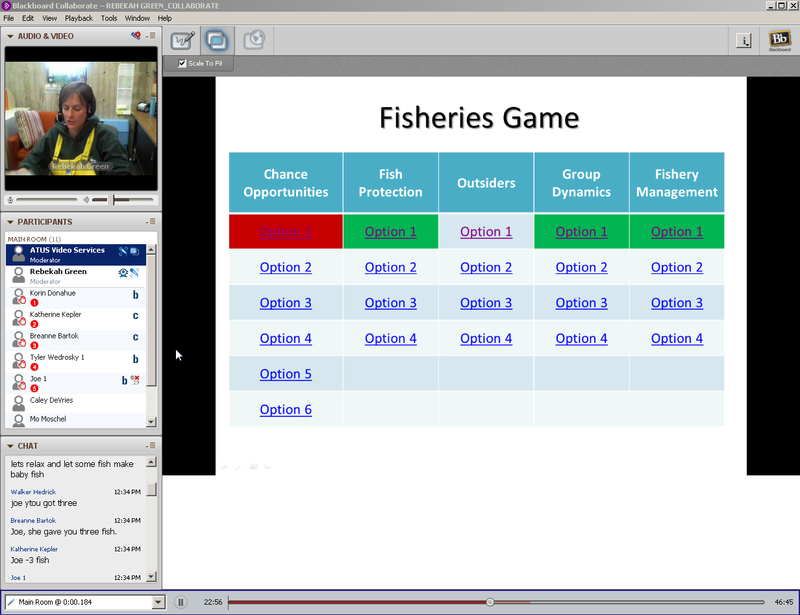 Playing a marine resource management game using web conferencing technology. Students from campus and off campus logged on to play together, with me dressing and acting the part of Oceans Master. Students used the vote function to indicate number of fish, used their mics to select choices, and raised their virtual hand to indicate whether or not they would fish each season. Students spontaneously began using the chat feature to discuss management strategies and share the burdens of better management practices. 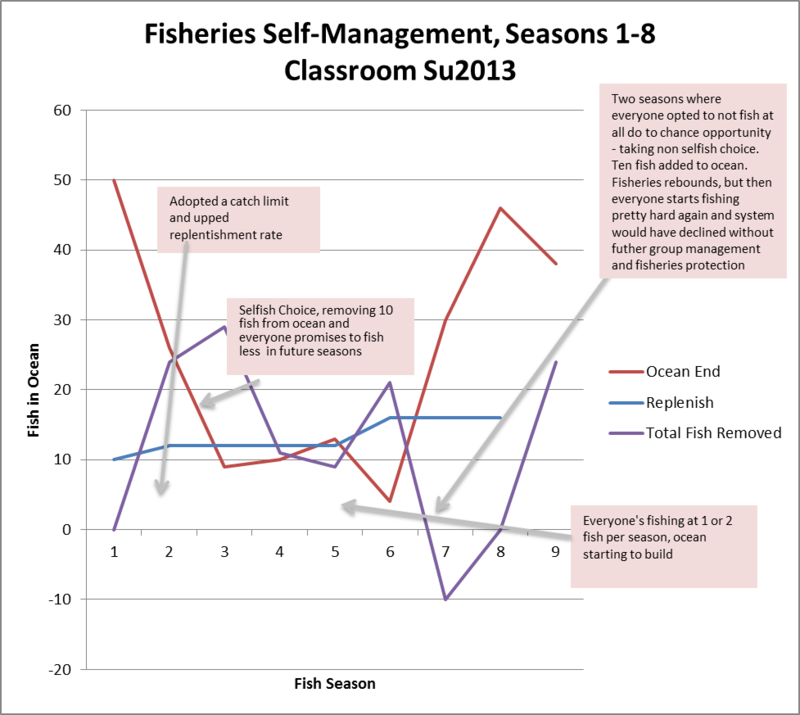 Graphed outcomes of the fisheries management game played with the traditional classroom group. Following each simulation, I show them how their ocean fishing stock (red line) faired as they attempted to competitively fish the stock and develop common resource management strategies. Student Presentations. Much like my traditional course, I had student groups develop final case studies of socio-ecological systems and then analyze a set of case studies together. I grouped the students such that students in-town could meet together face-to-face to collaborate and eventually present the work together. For students taking the course from a distance, I helped them develop online collaborative spaces to work together. These students experimented with the technology, with some groups creating and recording joint presentations they then sent to me and their other classmates. Other groups jointly presented their work at a final online meeting using the web conferencing space. The on-campus students presented in a traditional classroom setting. My understanding of teaching has changed through my experimentation with blended classrooms. I found my online interactions were an opportunity to engage more fully with students and with the subject material. The discussions online were deeper, more thoughtful and engaging for me and the students than classroom discussions had been in a traditional setting. I could count on every student having done the required readings before coming to the discussion, rather than a small percentage. Every student contributed thoughtfully, rather than the few outspoken students alone. Rather than having to multi-task listening to students, formulating my thoughts, and gage time in a traditional classroom, I could read and even re-read a student�s thoughts. I could even ponder a discussion for a while, returning to add a more thoughtful and thought-provoking response than is possible under the real-time conditions of a traditional classroom. My begrudging decision to try online teaching turned to a surprising support for the method when blended with traditional instruction methods. Perhaps the most important aspect of my experience with blended learning was how it widened my ability to reach non-traditional students. 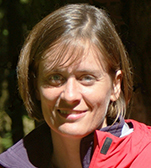 Teaching Human Ecology and Sustainability as an online course, with traditional classroom components, allowed place-based students on Huxley College�s Olympic Peninsula to enroll. About a third of the students were Peninsula students � students who had never been able to take a course with main campus students and faculty. The result of blending formats and blending students deepened all of our learning. Students from the main campus brought perspective of urban and suburban dislocation from nature, but also innovative ideas for increasing social connection. Students from the peninsula brought their lived experiences of tribal and mainstream natural resource management. Young adults found themselves in learning communities with older students who were returning to school. Our online discussions, classroom and online synchronous meetings grew in depth and complexity with the diversification of perspectives the blended format provided. The students also found that the online elements of a blended classroom provided a surprising level of flexibility. They, too, could think about issues more deeply when not having to listen and engage all at once in a classroom. They also liked the flexibility of being able to watch lectures multiple times from a phone or computer, from their bedroom or even on a beach chair. They liked having the power to stop me when their minds became too full or when they found their attention waning. They liked an environment where everyone contributed more equitably to discussions, rather than hearing from (or being one of) the most vocal students. Many also liked the efficiency of learning -- the way the video lectures and online discussions eliminated the class time typically spent waiting for others to stop shuffling papers, the professor to get started, or to wait until someone could formulate a response to a question posed. Yet, of all the course elements, it was the face-to-face or online synchronous meetings we all saw as the cornerstone of the course. These meetings brought faces or voices to disembodied posts. A student walking into the first face-to-face class meeting commented she felt she knew us all better than she ever knew classmates even at the end of the term for a traditional class. Several other students agreed. While only anecdotal, I was intrigued and heartened to see that the students in the blended online course engaged in collaboration more quickly and more consistently during the resource management simulation than students in my traditional class had. Seeing this, I knew I wanted to blend traditional and online courses more. I am looking forward to blending my classes further. I plan to add more synchronous, and ideally face-to-face meetings, to my next online course and more online journaling and discussion spaces in my traditional classroom. Rather than ill-fitting guest lectures or marginally beneficial films to fill a day when I may be out of town, I plan to use video lectures. Existing video lectures, screen captures, and online films have already given me a means of supporting students who wind up behind because they could not participate in class due to medial or hardship leave. Blending online and traditional teaching techniques is expanding my repertoire of tools to better teach students with diverse styles and needs. It is an ongoing series of experiments, some more successful than others, rather than a fully-formed pedagogical framework. It has made teaching as much a learning experience for me as for the students, and for that I am grateful. Smith, R.M., Conquering the Content: A Step-by-Step Guide to Online Course Design, Jossey-Bass, 2008. Bean, J.C., Engaging Ideas: The Professor's Guide to Integrating Writing, Critical Thinking, and Active Learning in the Classroom, Jossey-Bass, 2011. Boettcher, J.V. and Conrad, R.M., The Online Teaching Survival Guide: Simple and Practical Pedagogical Tips, Jossey-Bass, 2010.